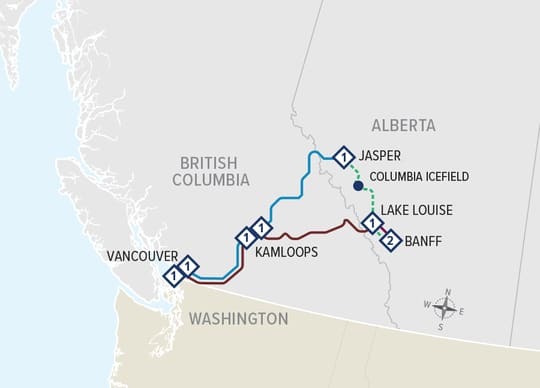 Beginning and ending in Vancouver, this circle trip to the Canadian Rockies includes four nights in the Canadian Rockies, two in Banff, one at the Chateau Lake Louise and one night in Jasper National Park. 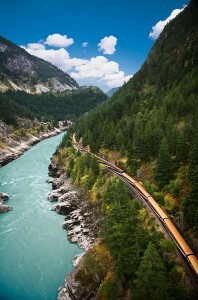 It also includes four days on the Rocky Mountaineer, two days from Vancouver to Jasper National Park and two days from Banff National Park to Vancouver. This package is available from April 15 to October 7, 2019. Call 604-990-9299 or 1-800-913-9207 or Email us for specific prices, more information and reservations. GoldLeaf Service – Reserved seating in the GoldLeaf elevated dome car. Breakfast and lunch are served in the GoldLeaf dining car and GoldLeaf passengers have access to the outdoor viewing platform.